In astronomical phenomena such as neutron stars, the strength of the magnetic field can be extremely large, approaching the quantum Schwinger field (4.4 x 1013 Gauss). At these strengths, pair production can occur leading to a plasma dominated by electron-positron pairs. It is inevitable that magnetic reconnection occurs at some points in the magnetosphere. In the context of this reconnection, multiple flux-tubes referred to as magnetic islands can be found. Compression of the fields of a magnetic island leads to enhanced radiative cooling, and in turn further compression. The resulting runaway process leads to QED effects such as pair production. 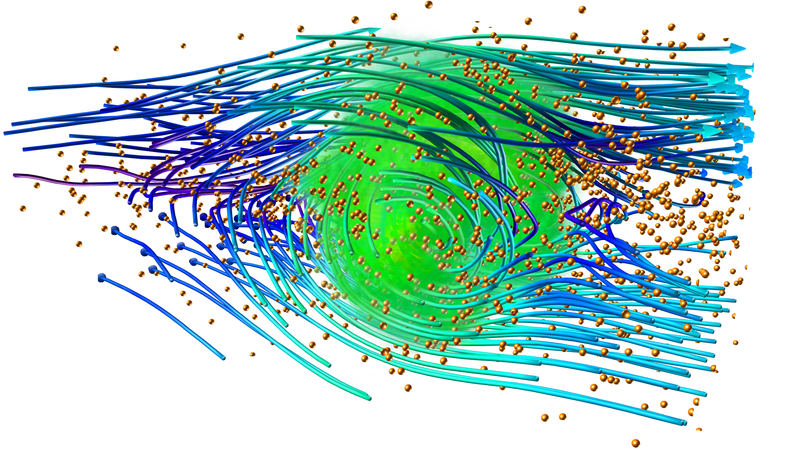 We have performed a 3D ab initio PIC simulation of magnetic reconnection, starting from a Harris equilibrium pair plasma, where most of the energy is in the form of magnetic fields, which takes into account hard photon emission and pair production at the rates predicted from QED. The image shows a snapshot of a compressed magnetic island generated due to reconnection. The magnetic field lines are colored by magnitude from weakest (purple) to strongest (green). The region where the field is compressed to more than 125% of the initial strength, at the center of the island, is highlighted in green. An x-point is located to the right of the magnetic island, where magnetic reconnection has provided the magnetic flux that is compressed inside the island. The emitted hard photons responsible for radiative cooling and pair production are shown to be clustered predominantly around the compressed field.